Organza is a thin transparent fabric, which is made from silk, polyester or viscose with twisting of two fibers. Organza is shiny and matte. This unusual fabric looks very good in the textile interior design. Also, the organza is very transparent, and skips a lot of light, which is good for decorative curtains. Before you sew curtains, you need to determine the amount of fabric for them. 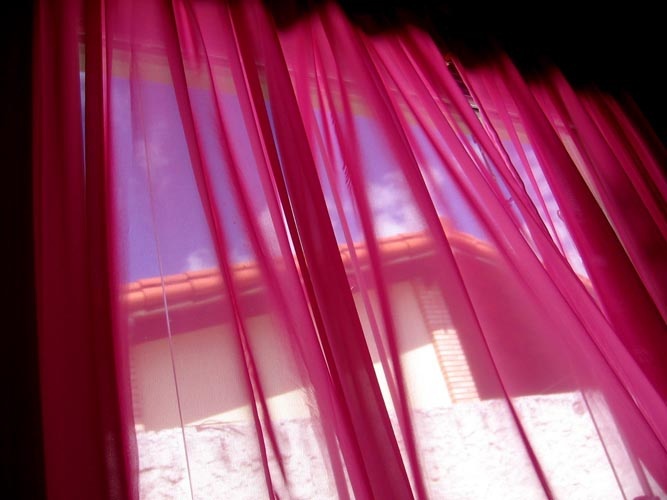 Tulle is usually to take the amount of fabric in 2-2,5 times the width of the cornice. In the case of organza can be limited to half the width (but not less). Then the top and bottom of the organza need to be trimmed in height from cornice to floor taking into account the seam allowance (2-4 cm). It is very difficult to cut the fabric evenly, so the edges require treatment. The bottom of the cut can be treated with bias binding. If the curtains were planned stripe curtain lace top can not handle binding, but simply tuck and stitch the edge. Then you need to pritchet curtain tape or braid, by means of which the curtain is gathered. The focal length of the ribbon should match the width of the blinds. Then we used tape to the curtain at least two seams. If the ribbon is wide, the lines should be more. Depending on the kind of braid on the curtains will drape folds. After the tape is sewn, needs to be ironed custom made curtains. You only have to pull the strings on the curtain tape and hang the finished curtains on the curtain. Before ironed ready made curtains, be sure to check the temperature of the iron, so as not to burn delicate tissue.